Sheldon Adelson, Rabbi Shmuley Boteach and Christians United For Israel — hardly a group representative of the American Jewish community — spent this Saturday convening a secretive Las Vegas conclave to fight BDS. The problem: their approach is all wrong, and the impact for Israel advocacy on campus could be dire. This wasn’t just any strategy session: they invited 50 organizations that work on college campuses, ranging from the political center to the most extreme and Islamophobic. At the end of the day, the organizations got to compete for millions in funding. The donors have made clear that with all this money, they want to “assign roles” and “command and control” our community’s work on campus. It’s clear who is most likely to be the biggest loser in all this: not BDS, but Israel, and the students who know that the best way to be pro-Israel is to be anti-occupation and pro-peace. There is more chutzpah in these three three short paragraphs than the proverbial son who killed his parents and asked for mercy because he was an orphan. J-street is lecturing Zionist organizations on Israel advocacy? Really? When has J-Street ever said a pro-Israel word to “Students for Justice in Palestine”? when have they ever written a letter to professors who want to boycott Israel? 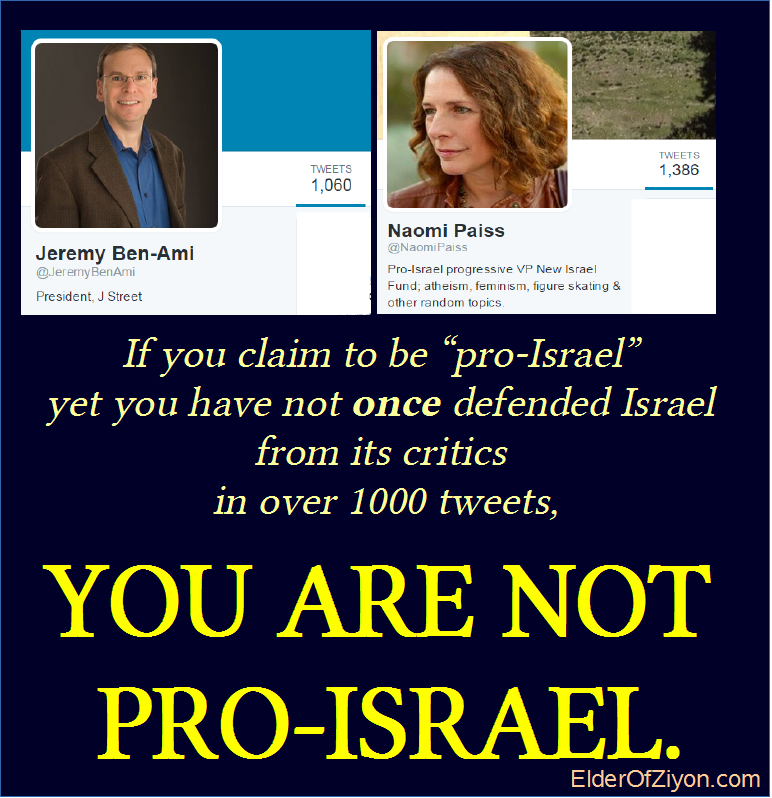 I’m still waiting for a single tweet from Jeremy Ben Ami that defends Israel against the worse kind of antisemitic, anti-Israel propaganda. J-Street characterizes a conference that has been widely reported in the media as “secretive.” This coming from someone who tries to sweep the anti-Zionist opinions of his own board members under the rug. This comes from someone who pretends to be pro-Israel but cannot allow his organization to explicitly say that they support a Jewish state because that is way too right-wing for J-Street. And, really, doesn’t use of the word “secretive” suggest antisemitic stereotypes? The language doesn’t bother them at all. J-Street claims on the one habd to oppose BDS, but on the other they invite BDS champions like Mustafa Barghouti and Rebecca Vilkomerson to speak at their conferences. So what in reality has J-Street done to combat BDS? Have they been vocal against the many divestment initiatives on campus? I have never heard them say a word in any of these public student debates on the topic – but they berate StandWithUs, who does a masterful job defending Israel and defeating these initiatives that J-Street seems to be de facto ambivalent about. Hezbollah claims Israel plans to destroy Al Aqsa. It’s sure taking a long time.